Moving from Guatemalan to Honduran, another fun little spot in Old Brooklyn is Cafe Sabor Miami. 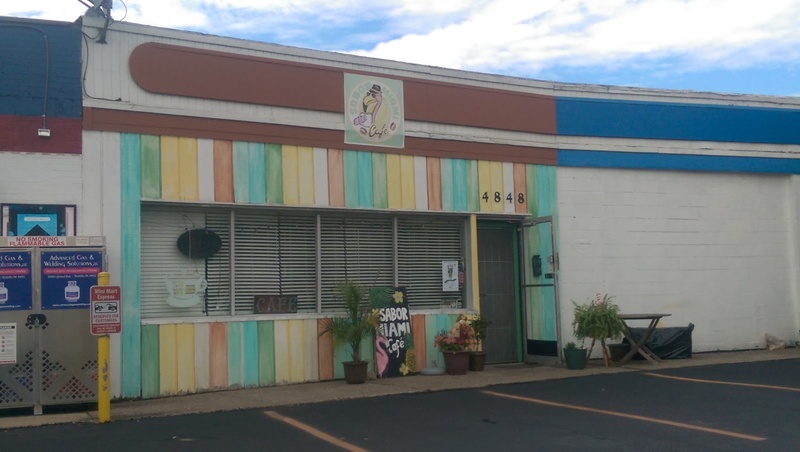 This place is tucked in a storefront with a bodega selling propane on Broadview Road (just north of I-480), so it is very easy to drive by and not even know it exists. It is in the old location of Pupaseria Katarina, but it looks completely different. Pupaseria Katarina was rather austere, whereas Cafe Sabor Miami is bright and filled with vibrant artwork. 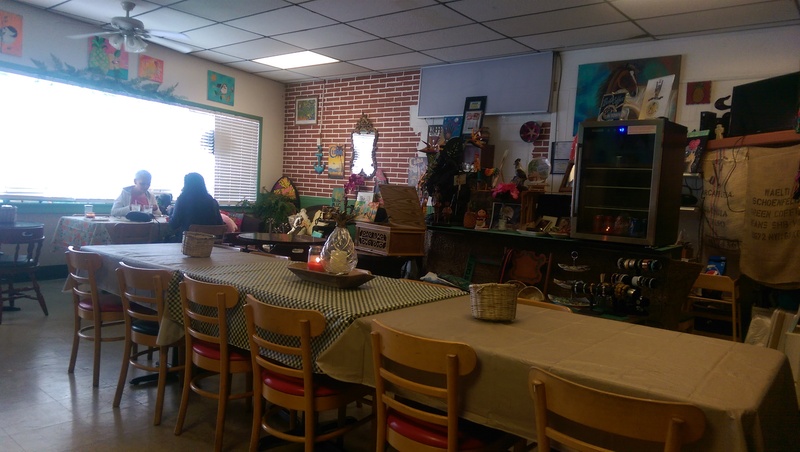 The charming tropical cafe run by Honduran native Mariela Paz opened in 2015 and has been quietly feeding residents ever since. 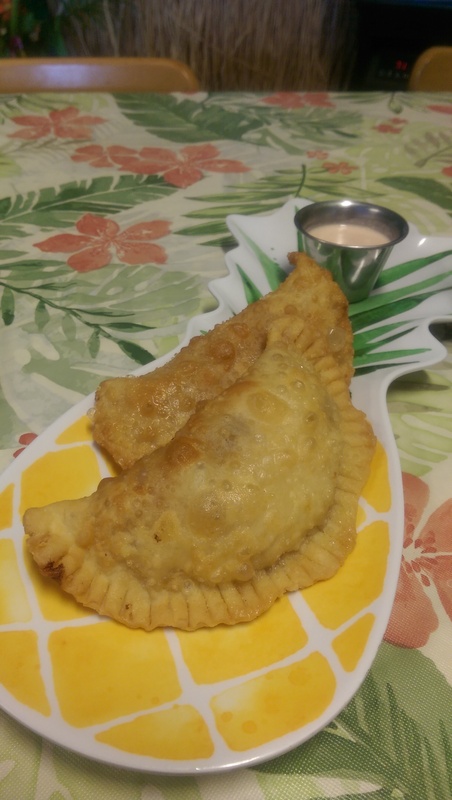 Paz lived in Miami for more than a decade and oversees a menu that ranges from Cuban to Honduran as well as Peruvian and Mexican featuring savory and sweet breakfast and lunch choices. I always say I am going to order some of her sweet pancakes, but the savory side of the menu keeps calling me. First, I must say that I have never been disappointed by the coffee choices here. 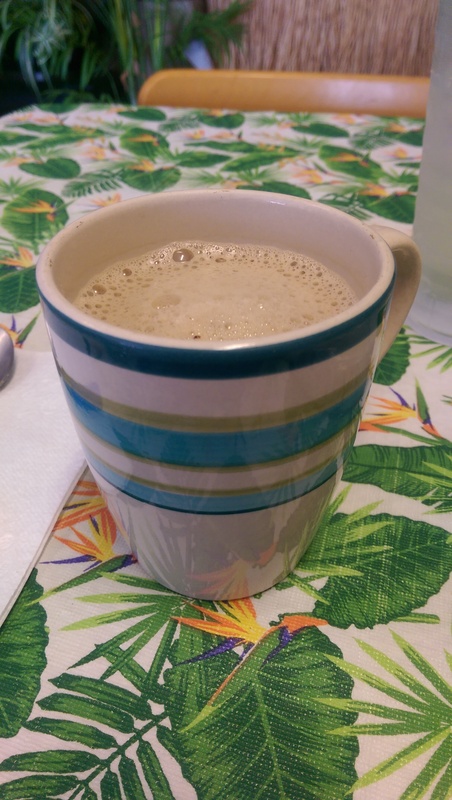 Apparently Paz’s family have a coffee plantation, so she is well-versed in coffee. 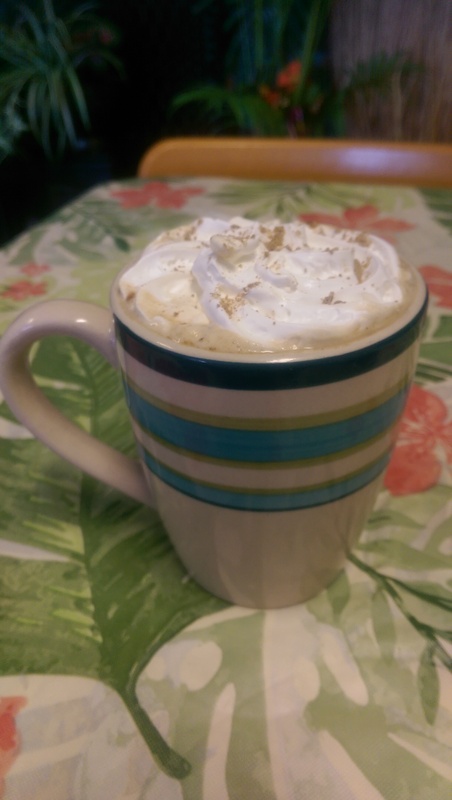 She offers lots of standard choices as well as some rare finds, such as Cuban Colada espresso, Oreo Mocha, Mojito Latte, Rose coffee, Cortaditos (cafe con leche with espresso), and Mayan Mocha, as well as smoothies and hot and cold tumeric beverages. As I’ve said, I love the savory side of the menu. The Tropichop is my favorite thing on the menu so far. The Tropichop is a rice-based dish with Latin flair. 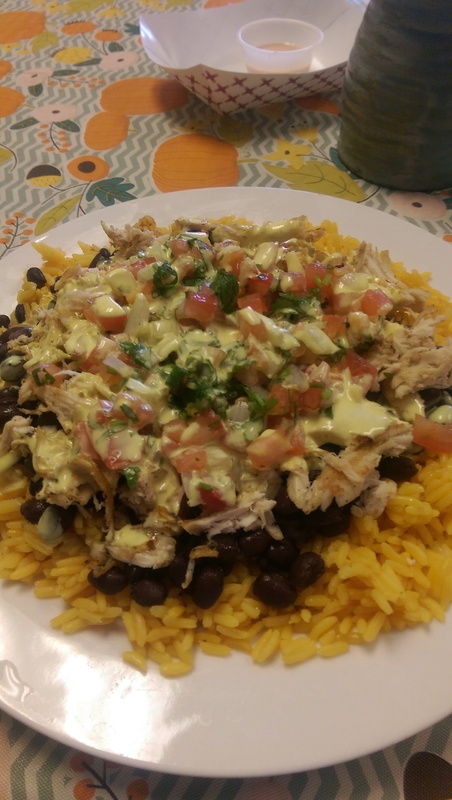 Yellow rice is piled with pulled chicken or pork, black beans, pico de gallo and curry sauce. The flavors meld really well together, and I love the light curry sauce, which is not overpowering at all. I have ordered it several times now. I also love her empanadas. 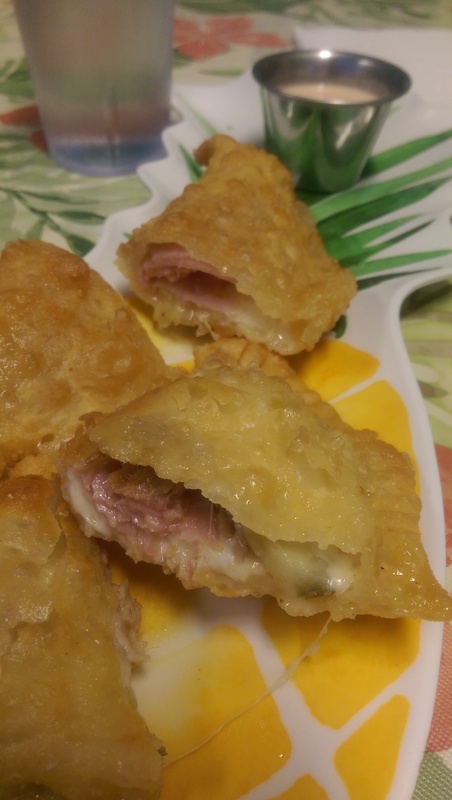 Each empanada is under $3 and is stuffed with filling and perfectly fried. 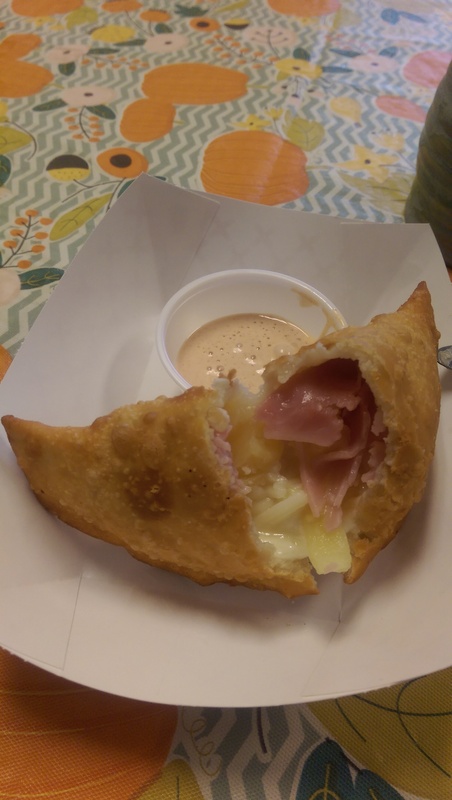 My favorite is the La Hawaiana, which is a ham, cheese and pineapple empanada, but the La Cubana (a Cuban sandwich in an empanada) is also quite delicious. One day I’m just going to order one of each and decide which are the best. Her pancakes like her plain or pecan or specialties like cinnamon bun pancakes, pineapple upside down pancakes, Caribbean Love (with lots of fruit), or Key West Lime pancakes are so tempting, but as a savory breakfast fan I tend to order savory. 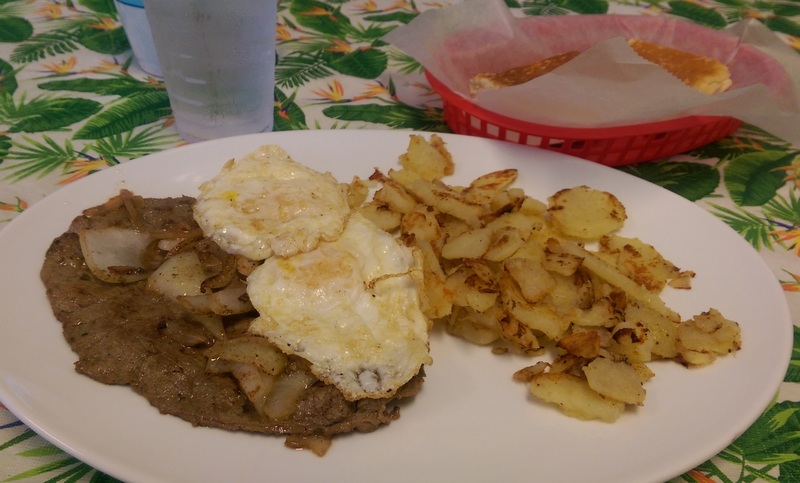 I ordered the Bistec a Caballo, which is a Cuban steak with eggs, onions, and home fries, the last time. I was absolutely blown away by the Cuban toast. 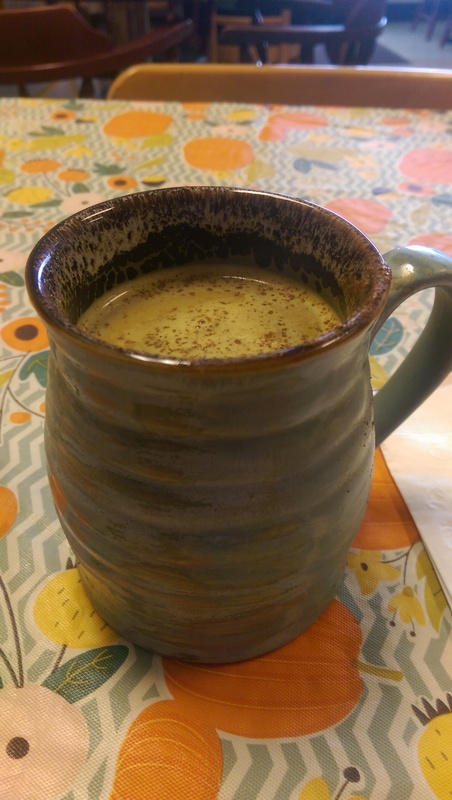 It doesn’t look like much, but it packs a crisp and buttery taste that I fell in love with. Mariela does a great Cuban toast! It has its own section on the menu, and you can order it with butter, mozzarella cheese or cream cheese and guava. Mariela and her staff are always so happy to see you when you walk in. I felt like a regular on my first visit. The place is bright and cheerful, filled with lots of Mariela’s artwork and taste. If I had to choose between Cafe Sabor Miami and El Rinconcito Chapin I would choose this place, but its limited breakfast and lunch hours ensure Chapin will also get some love from me. But Cafe Sabor Miami is one that should absolutely not be missed!